Albert van der Sel : The Grad and Div operators. In the series: Note 17. Subject: The Grad and Div operators. This note: Note 17: The Grad and Div operators. Please be sure that you are on a "level" at least equivalent to the contents up to, and including, note 16. Chapter 1. Some words on Rn -> Rm functions. which can be represented by a mxn matrix. This is a sort of "vectorial" approach. Take notice of the fact how remarkably "general" such a theory as linear algebra actually is. On the other hand, we can use the approach from "calculus", or "analysis", which study functions in the broadest sense possible. So, in early notes in this series, we have seen quite a few y=f(x) functions (e.g. linear, quadratic, polynomials, goniometric functions like sin(x) etc...). Usually, one starts with the study of functions of one variable like y=f(x). However, in note 11, we started "scouting" functions of more variables, like z=f(x,y) and w=f(x,y.z). as "surfaces" in 3D space. If needed, take a look at note 11 again. like z = f(x,y) = x2 + y2 maps points (x,y) to the value "z", and thus is a R2 -> R function. So, since the "endresults" of the functions are simply "scalars", mathematicians call them scalar functions. For each point (x,y,z), it is mapped to a scalar. Analysis great for studing vector valued functions too. Here, that means that a single variable (like "x", or "t") is mapped to a vector. Here real values "t" are mapped to 2 dimensional vectors. Here real values "t" are mapped to 3 dimensional vectors. of such function like G(t), are different functions by themselves, there might be ranges of "t", where such component fuction is not defined. determine which ranges of "t" are excluded. Analysis provide for methods to explore, and describe, functions that map Rn to Rm. Below is just an example to make the statement above rather plausible. So..., what would you think of the following mapping? F((x, y, z)) = (2x – 2y + z, 3x + y– z, x + 5y, 6x – 3y + 3z). components in that mapping are by themselves, individual functions, like for example the third component "x + 5y". By the way, the whole thing, that is "F" is a function too, and in this case, it can be proven that it is also a "linear map". You can say that linear algebra, and analysis, are seperate sets of ideas and methods, but describe largely the same math and objecys. But at the same time, they still have there own "specialties" (so to speak). There exists certain "differentials" that provide extra information of the types of functions that we saw above. Those functions can for example be multi-variable scalar functions, like φ(x,y,z), or vector-valued functions. Why would that be of importance? The operations described below, are simply mathematically possible, and may provide extra insights of the functions themselves. From a standpoint from physics, it's really great since the differentials give additional insights in physical processes. Chapter 2. The gradient, or ∇ operator on a scalar function. Suppose we have a scalar function φ(x,y,z). If needed, take a look at note 11 again, where I introduced partial derivatives. relates the rate of change of φ(x,y,z), compared to the the rate of change of "x". Ofcourse a similar argument holds for the partial derivative on "y" and "z". So, for each point (x,y,z), where φ(x,y,z) takes on a well-behaved value, we can calculate the partial derivatives. Now, we may "make", which at first sight may seem, a remarkable construction. object that defines a "magnitude" and "direction", which characterizes the change of φ(x,y,z) with the change of space. It's remarkable indeed. In a moment we dive a little more into how we must interpret this. of some point (x, y, z). then ∇ φ gives us insight in the rate of changes of that flow (magnitude and direction) in space. The example above, was about φ(x,y,z), thus a function of R3 -> R.
type of equations can be constructed as illustrated above. Then the partial derivatives are: ∂/∂x φ(x,y,z) = 6x, ∂/∂y φ(x,y,z) = -5, ∂/∂x φ(x,y,z) = -cos(z). And here ∇ φ is notated as a row vector. Note that the rate of change of φ, now is known for every point (x, y, z) for which φ(x,y,z) is defined. You can substitute any valid point (x,y,z), like e.g. (1,1,0) in ∇ φ, and you will get a specific vector. This technique is used in many sciences, and also often implemented in computercode in order to graph flow-fields and the like. Chapter 3. The Div operator on a vector-valued function. In chapter 2, we saw how to construct a "vector" from using the "gradient" operator on a scalar function. -So, here, the "endresult" is a vector. If we look at equation 3 again, we see that we can represent ∇ as a vector. of ∇ with F. From note 12, we know that the inner product of two vectors, is a number (a scalar). -So, here, the "endresult" is a scalar. Ofcourse there is an "interpretation" (or explanation) of why we should do this type operation. Let's first demonstrate the technique, and then discuss the interpretation (of why we would want to do this). For a point (x,y,x), this operation returns a scalar. You may also compare equation 4 to equation 1. Indeed, we do not see any basis vectors. Equation 4 is just a summation of numbers (for a certain point). So, what is behind it? How can we interpret ∇ · F? Maybe the idea of "flux" can contribute to this. The Flux Φ of a vector field. Suppose we have some vectorfield in space, like an Electric Field, or a Magnetic field. However, if you like something like the flow of wind (or water etc..), then that's is fine with me too. Everything is ok, as long as you mentally can "imagine" a sort of vector field. -Now, also imaging an open Surface like a square (or other figure). the surface is low. But suppose that the field is very intense, then we say that Φ is high. (1). If the field is perpendicular to the surface, Φ has it maximum value. (2). If the field is parallel to the surface, Φ is "0". (3). If there is an angle between the surface and the field, only the perpendicular component of the field contributes to the Φ. So, Φ is a measure for the number (of intensity) of fieldlines passing through a surface. If the field gets stronger, then Φ gets larger, and if the surface area "A" increases, then Φ increases too. For a flat surface, and a uniform field F perpendicular to "A", then Φ = |F||A|. If there is an angle α between the uniform field and the flat surface area, then Φ = |F||A| cos(α). -Now imagine a closed surface, around a volume, like a sphere, or peach-like volume, or something like that. If fieldlines pass through such a surface, you may wonder what the "total" flux is. From a certain side, fieldlines enter the surface, but may exit that surface at the other side. Makes it really sense to talk of a "net" flux? then we may have only fieldlines enter the surface, and never come out. This yields a netto total flux too. enclosed by the surface, then the total flux through that closed surface is "0". Further analysis of equation 4. It represents the infinitsemal change of F in an infinitsemal small region. change of "f" compared to the infinitsemal change of "x". the flux through the tiny surface of that cube. Say that the (extremely small) volume "η" can be characterized by "Δ x Δ y Δ z". You do not need to remeber the following reasoning. Just read it, since it helps in understanding the meaning of ∇ · F.
We want to determine the difference in flux, through the lower z-plane of "η", and the upper z-plane of "η". Then we will do the same for the y- and x-planes of the cube "η". since Δ x Δ y represents the surface of such a z-plane of "η"
Now, we can do the same thing for the differences of the y- and x-planes of our cube "η". -Note that the second "string" is ∇ · F (as we know from equation 4). 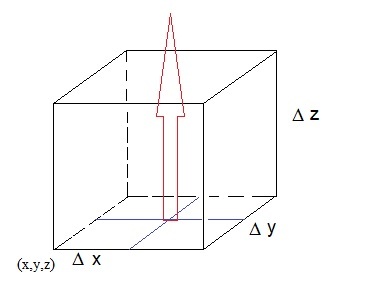 -Note that Δ x Δ y Δ z is the volume of our small cube "η". It's the same sort of equation as "a = b x c". We have a=0 if c=0, if b has a certain value, no matter how small. And if c=0, then a=0. So, if we have a small volume, and some net flux is coming out (or in), then ∇ · F is not nul. Also, if we have a small volume, no flux is coming out (or in), then ∇ · F is nul. immediate neighborhoud of the point (x, y, z). That's why ∇ · F is also called Div F (divergence F). For example, a stationary point charge sits in Δ x Δ y Δ z, which is responsible for an Electric field. Then, ∇ · F will not be zero. If that point charge is outside Δ x Δ y Δ z, then ∇ · F = 0. Remarkably, the divergence of the Magnetic field (Div B) is nul. But a magnetic monopole has never been observed. This is a classical approach, and physicists believe that true point-like particles are no reality. However, for a classical vectorfield, the theory holds up. Although the discussion above will not get the first prize, it hopefully gave an understanding of ∇ · F.
needs to be introduced first (I think). So we will see that in the "Basic series on Physics".